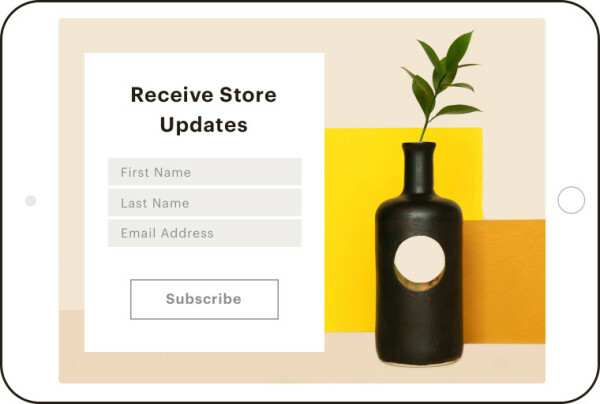 Signup forms are an easy but powerful way to extend the reach of your email marketing and enhance your long-term audience growth. 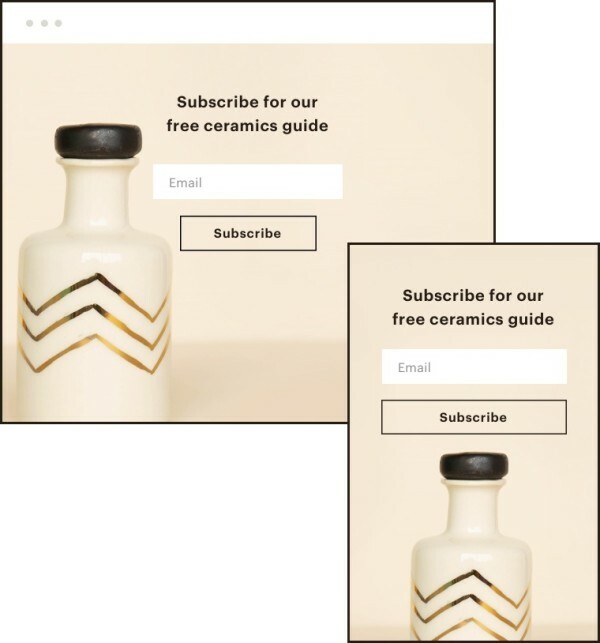 Mailchimp offers a number of options to attract subscribers from different audiences. Start with our basic hosted form, or try one of our intermediate or advanced options. You can embed a form on your website, or add a form to social sites like Facebook, and platforms like WordPress. 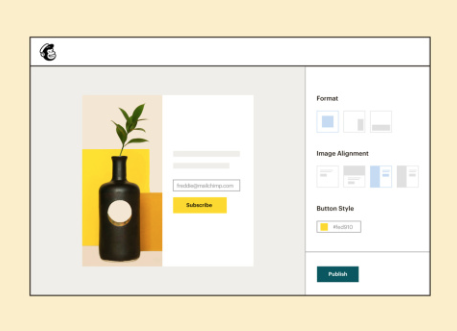 In this article, you'll learn about Mailchimp's signup form options, so you can choose which type of form is best for you. Mailchimp audiences are single opt-in by default. That means, each time someone fills out and submits your signup form, we'll add them to your Mailchimp audience. This makes it easier for people to join your audience, which can be helpful if you're selling a product or capturing customers on the go. We also offer the double opt-in signup method, which requires email verification. If you've received a high volume of bounces, unsubscribes, or complaints, double opt-in is recommended. You’ll be able to choose the opt-in settings you want to use on your forms each time you create a new audience. If you want to change your audience’s opt-in method, update an individual audience’s settings. Or, if you have multiple audiences, you can make changes globally on the Opt-In Settings page. Take a look at these articles to learn more about the signup process. We offer a few different shareable form options that are published and maintained on our servers. Design a shareable landing page to collect new contacts. Landing pages use our Signup Form content block to create a simple form with the email address field from your audience. Use this type of form as part of a specific marketing goal. For example, boost your audience growth by collecting addresses in exchange for a free download or other limited time offer. We automatically generate an easy-to-use, shareable signup form for each audience. Customize the form and share the URL on your website, or with potential subscribers across your digital channels. Use this form if you need a shareable signup form that doesn't require you to work with HTML code. Paid users with HTML experience can custom-code their hosted form in Advanced Form Mode. Our web forms make it easy for potential subscribers to sign up to your audience directly from your website. We have two types of web forms: the embedded form and the subscriber pop-up form. 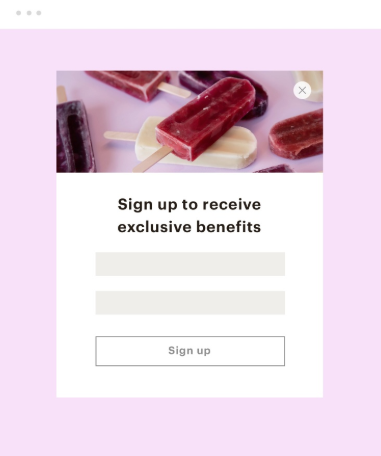 Use these forms as a part of your long-term audience growth strategy, and for greater control over your signup form branding. With our embedded forms, you choose the type of form you want to display on your site, and we give you the code to use. Choose from our Classic, Horizontal, Condensed, and Unstyled forms. If you're comfortable with HTML, edit the form code to fit your organization's style and brand. Mailchimp Subscribe is a mobile app for your tablet. It's a simple and powerful tool to help you grow your audience in your store, at events, and on the go. Use it to build signup forms and collect subscribers when you're working face-to-face. If none of our form options work for you, or if you need to set up your form through an integrated platform, take a look at our integration and plugin options. Here are some resources that can help you get going. For complete control over your signup form process and opt-in settings, code your signup form from the ground up and pass subscriber information back to Mailchimp through our API. Still not sure what form is right for you? Try a few to test them out. After you set them up, wait a couple of weeks and measure the performance of each form. To do this, create an audience segment by signup source, and see which form generated the most subscribers. Here's an overview of Mailchimp's available form types.